(Nanowerk News) Thanks to a new semiconductor manufacturing method pioneered at the University of Illinois, the future of solar energy just got brighter. 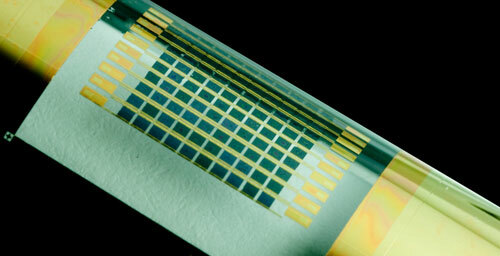 A flexible array of gallium arsenide solar cells. Gallium arsenide and other compound semiconductors are more efficient than the more commonly used silicon. The Department of Energy and National Science Foundation-funded team also includes U. of I. postdoctoral researchers Jongseung Yoon, Sungjin Jo and Inhwa Jung; students Ik Su Chun and Hoon-Sik Kin; and electrical and computer engineering professor James Coleman, along with Ungyu Paik, of Hanyang University in Seoul, and Semprius scientists Matthew Meitl and Etienne Menard.